Needed something easy to do today, so I could really just focus on some more important things... Like watching TV. So I started out by watercoloring some more vintage book pages. 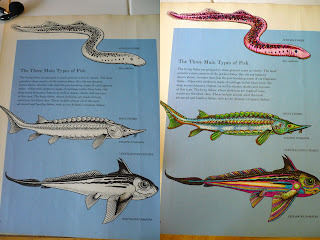 Here's a before and after on a fish page. I've since cut out the fish and I'll likely make cards of something out of 'em. A lil kawaii jellyfish. I started out with a thicker brush for the bell part of the jelly, and I regret it, as the line is muuuch too thick & it looks stupid with the rest of the lines. I've always like peacocks! They're just so fancy. Random duck and things.. jellies, etc. I think his legs look stupid.